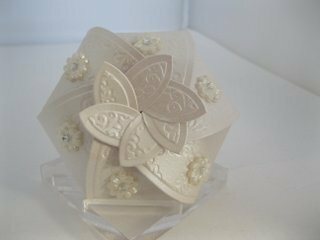 Spellbinders Hexagon Pinwheel Box is another beautiful design and together with your imagination the possibilities are endlesss. This pretty box is not very big but it can be decorated up to suit any occasion, and is reasonably flat on completion. 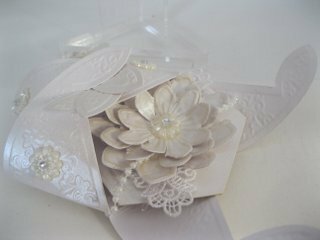 This is one I created as a "Thank you" card for a wedding and the whole box has been embossed to give texture. The small pearl flowers have had Diamante added to the centres. The shaped ends to the box all fold together to create the Pinwheel top. The video will show you how to create this little project for yourself. 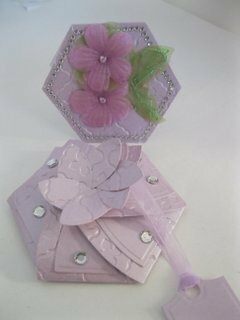 Creating the small card to place inside the box just adds another dimension and it is on this that you can add any sentiment you wish, or use it as your invitation to a party or function. Emboss and decorate it to match the box. As long as you keep the embellishments on the front of it low you will have no trouble placing it inside. You could also use it just as a tag to be added to your gifts with some lovely ribbon and a large bow. This is the little card that goes inside my box. 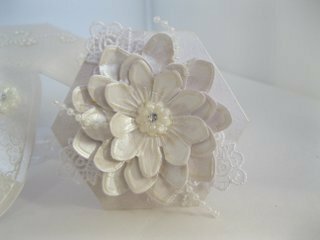 I have added a layered flower and surrounded it with lace leaves and some pearl string. 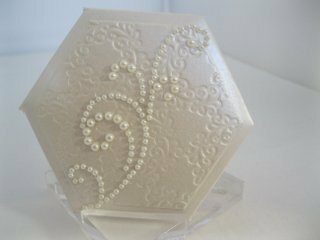 The centre is a pearl flowers with a small diamante added for an extra luxury touch. Once both items are decorated to match just slip the card inside. Fold up the Spellbinders Hexagon Pinwheel Box and it is ready for you to give to your recipient. Create them for any occasion you can think of. Alter the colours or the embellishments that you add or even add some ones name to the with a small alphabet stamp. Use double sided paper for another look and then the inside will be as pretty as the out. 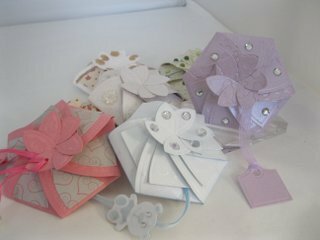 ... How about a Baby Shower invitation ... a coffee morning invite or maybe to a BBQ in the summer months. A small Birthday card that you can give with your gift ... or as a thank you card like I did. You can make them for anything that comes to mind and I hope you enjoy the tutorial.